You know we had that Guest Designer call for July last week. And we got so so so many awesome entries. I didn't find the time to comment on all of them - but I'll come around and do so! Do you know what I loved MOST about this call? It became a social event. Many of you started visiting the other blogs, leaving lovely comments and wishing each other luck. This is was such a fair and friendly competition that it made me proud of you - and proud of the thing WE do, also. I'd really love to say THANK YOU to all the applicants, the ones who commented, the ones who visited other blogs. Also a thank you to the supporters who did not play along but shared on their Facebook-page or where ever. Thank you all so much! Well, we did have a hard decision, you know? There were fabulous entries and many cards that I fell in love with. I talked to the team, we picked out favorites, we talked even more and then we finally made a decision. 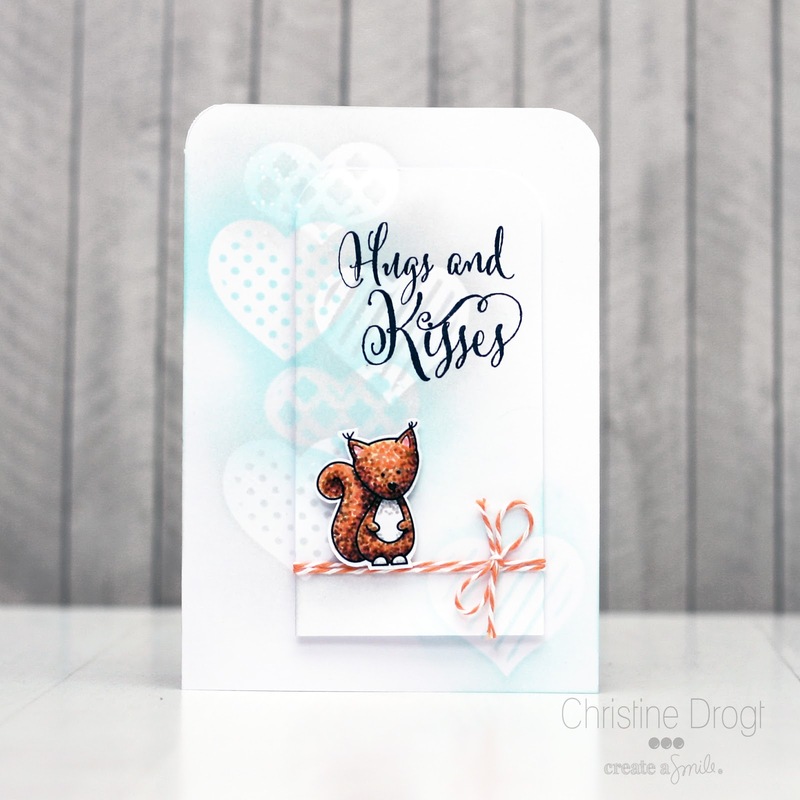 Our Guest Designer is: Cindy Lovell!!! This birdy-card really stood out to me, don't you think it's fantabulous?! Showing us that you really LOVE our images. It was so obvious Cindy want to get the best out of them! Great Photography! I found out that card that really catch my eye are usually the ones with the best photo. You want your projects to SHINE so take your time to take great photos! That makes a bigger difference than you might think. Well, you might realize that many of those points worked for most of the entries. But there was one more applicant who HIGHLY fits into that pattern. So we decided to already give away the spot for September also (We also have a special Guest for August, woohoo!). 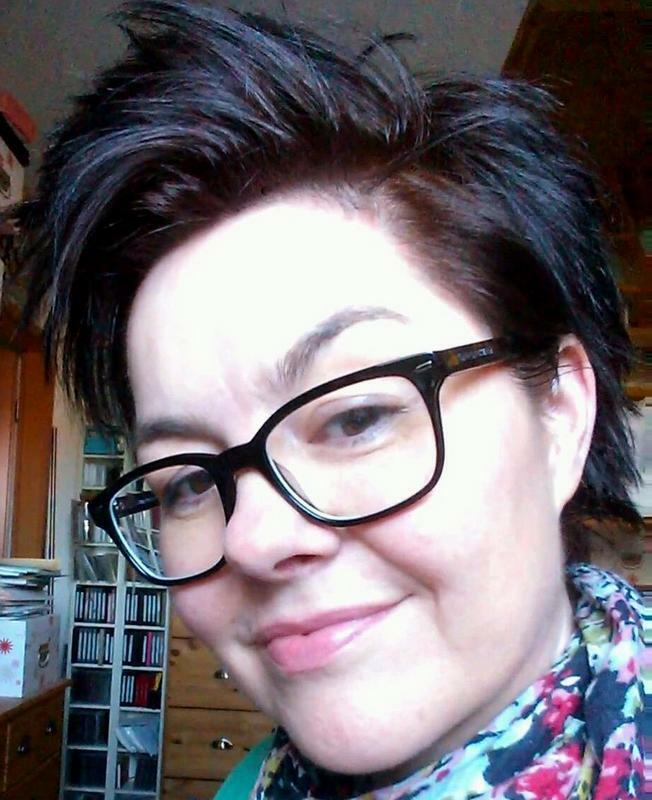 Our Guest for September will be Anja Curvers! 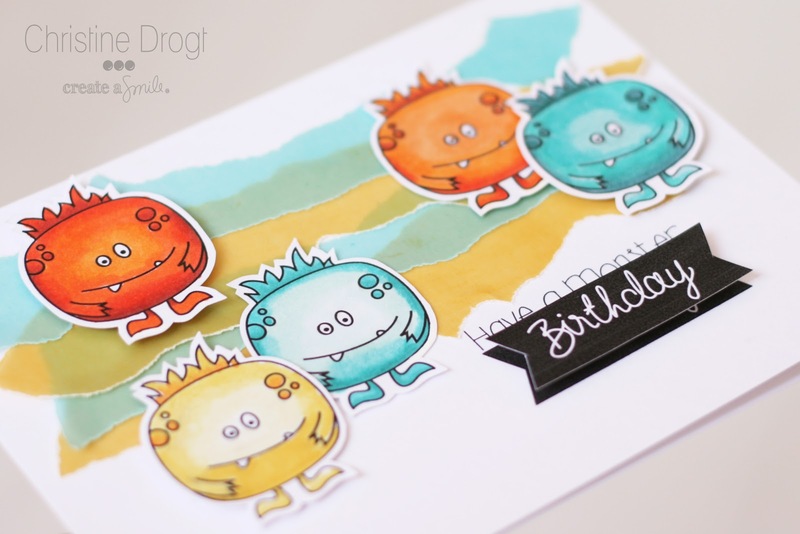 Anja created quite a few cards for this challenge and they all were perfectly executed! Great design skills, good photos, nice comments for all the others. She really fits the team! Congrats to you Ladies, we can't wait to be working with you! Hi stampers, Anni here! Things are getting so exciting overhere in Create A Smile-Land: Yesterday the stamps arrived at my house - they are FANTABULOUS! Can't wait for the release on the 11th of July to show you the fantastic sets Christine designed - she is so talented! I made a card for the current Keep it Simple! 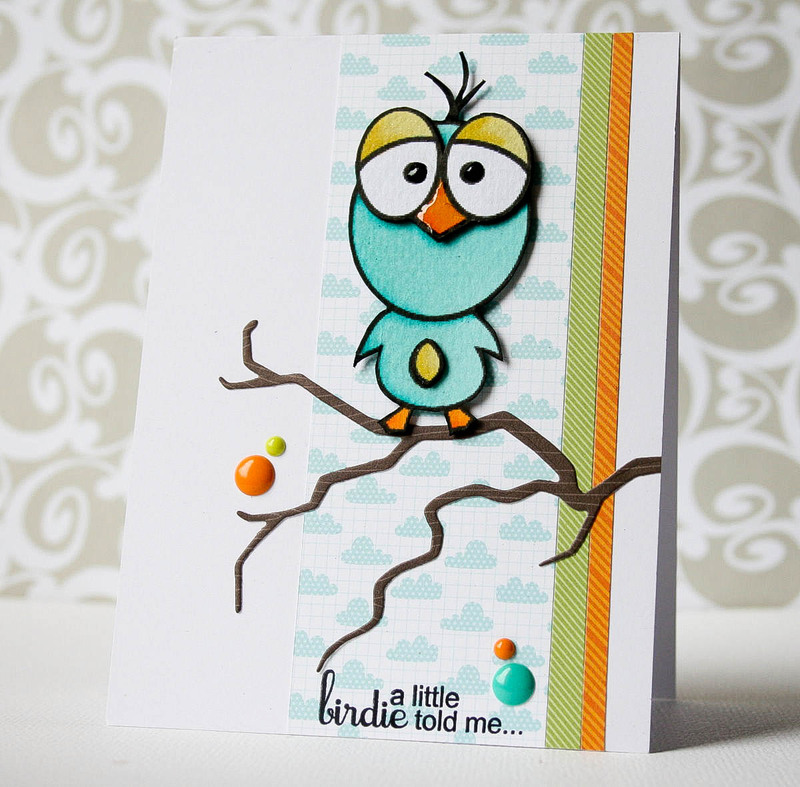 challenge: Lots of Turquoise and used the cute freebie bird from Create a Smile. As you can see it is no problem to print him in a big size! To give him a little more texture I added dots, glossy accents and I dabbed his body with a paper towel and Copic cleaner. The sentiment means Happy Birthday! 300 Facebook-likes! 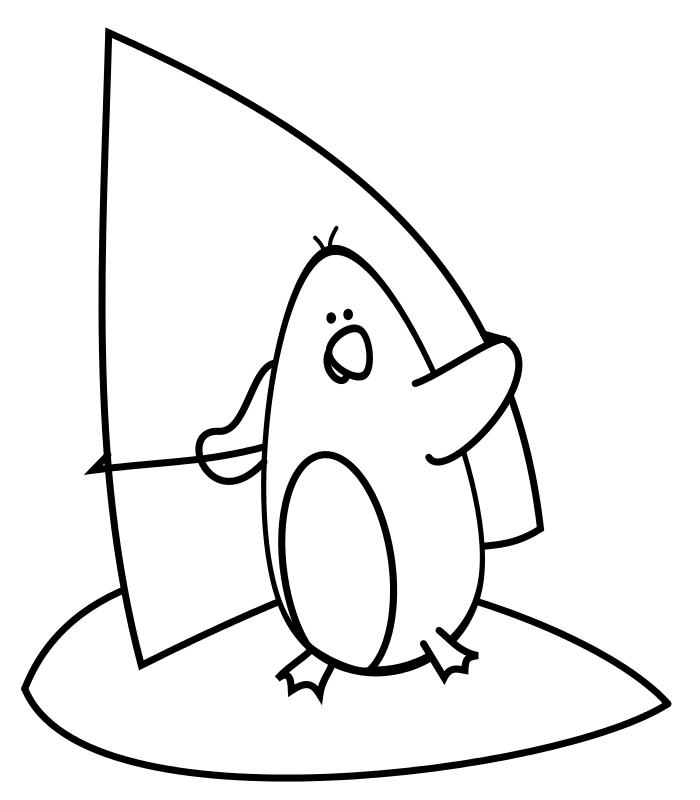 The penguin is waiting for you! Yay, it tok some time but we finally hit 300 likes on our Facebook-page. Our Guest DT Call is still open until tomorrow, so ow you have one more image to play with. Lucky you! I hope you love that guy :) I can'twait to see what you all might come up with! I've been lovig ALL your creations during the last weeks - keep 'em coming! Fridays - oh how I love them! Our stamps arrived yesterday (Finally - I don't think I could have waited any longer!). Yummy stuff, I can tell you! And this feels so exciting for me to see those designs turned into actual stamps. So we have a release date (If you like us on Facebook you already know about this). Our first release will be on July 11th. Two weeks from today - wowzers. Before the stamps are sold there will a release party - so make sure to stay tuned! And we will have fabulous guests for the release - exciting things are happening. Okay, so for today I have a card using the bath tub from one of the upcoming sets. I guess you've already seen it on one of Kellys cards, so I thought I'd share a card with it as well. In fact this is the first card EVER that was made with our actual stamps. 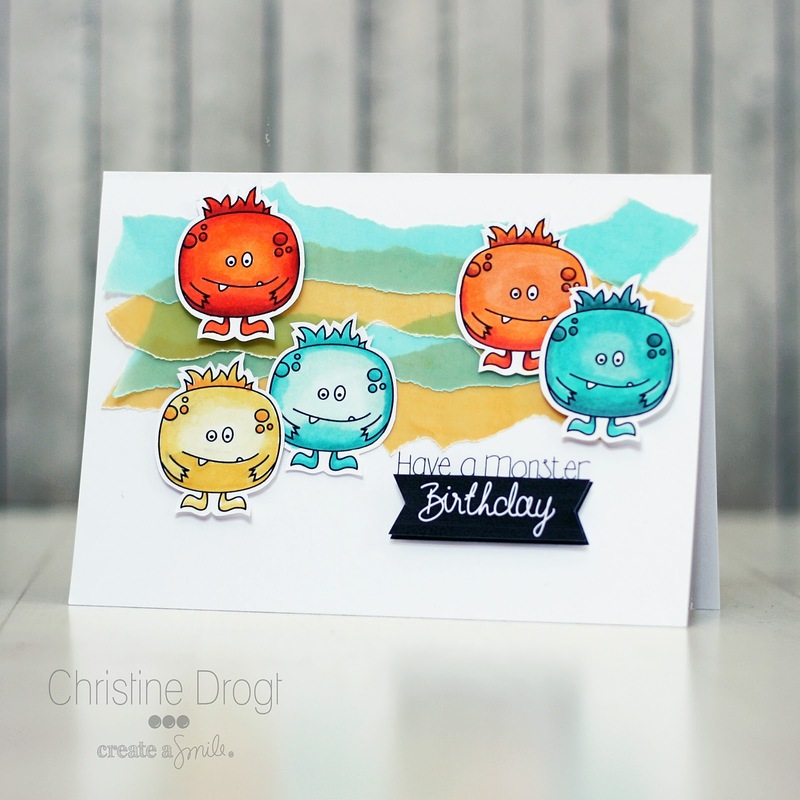 I made it as a DT member for the Keep it Simple Challenge (Use lots of turquoise). Maybe you'd like to play along? The bubbles were directly stamped onto the patterned paper and covered with a white gel pen. Well, it was digital paper that I printed out, so the gel pen kind of mixed with the printer-ink - not a bright white, but quite nice for the bubbles. (Maybe there's a way to actually USE that effect on cards - I'll have to find out!) I also added glossy accents to the bubbles. Thanks so much for stopping by - I am so happy about all the nice feedback that we get. Don't forget that we have a Guest Designer-Spot challenge going on until TOMORROW: So if you haven't played along yet - it's time to hurry! Isn't he the cutest?! I cut some yellow paper into rays and added some dimension with mustard seed distress ink. I seriously can't lay off the distress inks, or the stickles, because I dotted them all over the sunshine rays. For the water I used an old EK Success punch on a bright blue. I also used distress ink to darken the background waves. See I told you, I have a problem. I wanted the waves to be more interesting so I created some "white caps" with my gel pen. Also, we have our first guest designer call going on right now and there is still a few days to enter! We love to see what you make!! Hi everyone, it's getting exciting! We decided to give away a Guest Designer Spot for our VERY. FIRST. RELEASE. - woohooo! You like cute and fun images? You have a blog and love to share your creations with your readers? You're a spontaneous person who comes up with ideas quickly? You'd like to be one of the FIRST PERSONS EVER who gets our stamps? If you answered those questions with "yes" we might be looking for you! 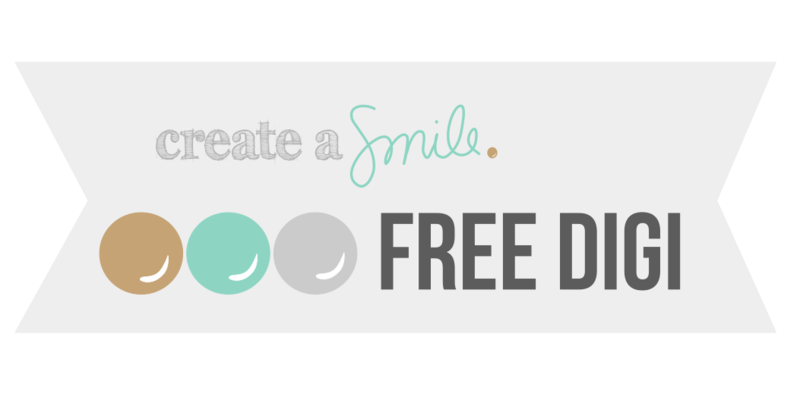 get one of our stamp-sets for free (and be one of the first people who receive Create A Smile stamps ever! (Exciting, right???). 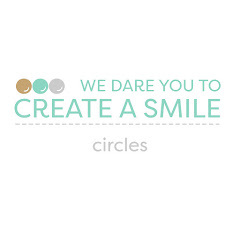 Add the "I love to play with Create A Smile" badge to your post and tell your readers about our Guest Design Team spot and link back to this post. Leave a link to your post (not your entire blog) using the linky tool. The linky tool closes on saturday June 28th at 8pm CET. Our first Guest Designer will be announced on Monday June 30th. We are beyond excited to see your creations and get to know you!!! I'm here with another fun card using the deliciously adorable images from Create A Smile Stamps! So, because the Design Team are still working off the digi versions of the images, I was able to really play around with the size of the animals. I freaking love this set. It's going to be called Friends in the Woods. Now, y'all are super lucky because this is one heck of a sneak peek at this soon-to-be-released set!! Once I had them all in the size and order I wanted them (on my PSE canvas), I printed them out onto X-Press It cardstock, then coloured them in with a combination of copics and Spectrum Noir markers. The sequins are from Neat and Tangled, the backing cardstock (aqua) is from Simon Says Stamp, and the paper is from and old 6x6 pad. Last week I though about art-techniques that I learned at school and remembered pointilism. Well, at school we did this with brushes (exhausting, because you have to be so so so careful!) and I wanted to incorporate this technique to a card. Well, it's fun! Have you ever tried this? I'm sure some of you did. What medium do you use? The team loves that little guy - so do I. (Insert puffy hearts here!) I know many of you will love it as well. I am still waiting for the stamps to arrive, so I used a printed version of that image. But it's the final size of the stamp. The sentiment is from Elle's Studio - beautiful, right? The background was created with some cutting files from Lori Whitlock (her designs are amazing! 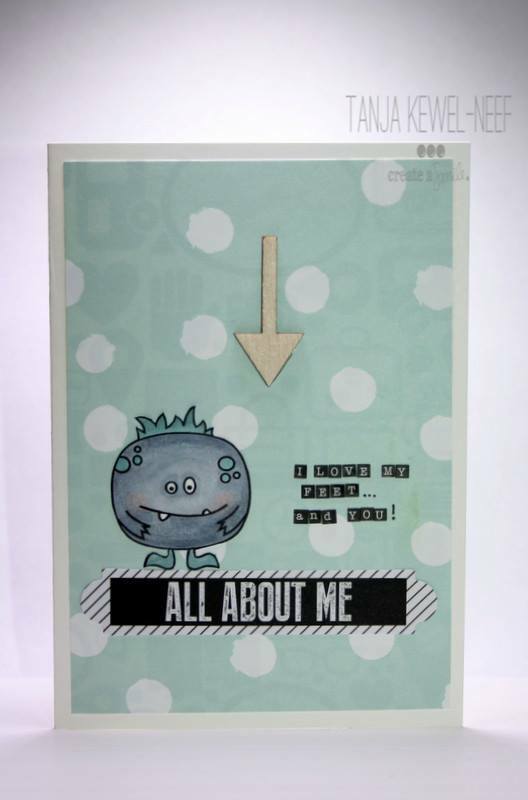 ), some Scrapbook Adhesives and Simon Says Stamp Inks. Check out the video for all the instructions! What an awesome team! And: Any questions? Wow, we had a few great days with our team-interviews, right? I didn't want to answer my own questions, but if you want to get to know me better: I'll start a post over on our facebook-page where you can ask questions and I'll pick some (if there ARE questions, haha) and create an interview from that to post it here. So what would you like to know about me? You can leave a comment here or on facebook. I'm looking forward to receiving some funny and creative questions. Of course: If you'd like to know something about the other girls: Don't hesitate to ask! Wow, that was a stormy night here in Germany. I hope all is summery, safe and quiet where you are. Today's the day to introduce our 5th and last Design Team member to you. I met Kelly on the A Blog Named Hero Design Team in 2012. She made me laugh all the time, because she says what she thinks, sometimes a little bold, but honest to the bone. That's something I really love about her. I know she'll let me know if my designs need something. And she has awesome design skills also! Please give her a warm welcome to this new adventure! Hi Kelly, happy you join us! Take a seat, get comfy. May I offer you something? Coffee or cookies? Just coffee. Preferably Dunkin Donuts with double cream and double sugar. Basically coffee flavored sugar water please. You’re a paper crafter. When did you start and how did it happen? I started scrapbooking in high school. (P.S. young girls don’t spend a lot time making scrapbooks of boyfriends. When you break up you’ll be heart broken to toss out all your hardwork, and not so much the boyfriend!) I eventually came across the wonderful works of Jennifer McGuire and was sold on card making. I hardly ever scrap anymore! What kind of projects are your favorite? And why? Is there one technique that you use more often than others? I’m a pretty clean and simple girl but I do love techniques. I especially puffy heart emboss resist. It never stops being cool! If you look at other people’s projects: What amazes you and what makes you frown? I love, love, love when others find a way to incorporate a ton of items and it still looks clean. I am icapable of doing that. They have these beautiful layered projects that don’t look at all cluttered. When I try that it looks like I took everything I left on my desk and just glued it on top of each other. Frown? Hmmm. Probably unsightly color schemes. You’ve been paper crafting for quite a while. Is there a lesson you learned that you’d like to share with our readers? Let’s get to something personal. You live in Ohio. what’s your favorite spot there and why do you think people should visit this place? Probably Put-in-Bay. It’s right on the lake and they have such fun stuff to do. Boat rides, fishing, camping, and wineries. Good stuff! What is a characteristic that describes you the best? I’m a Christian, wife, and mother to a sweet one year old. Being a Momma is rewarding and exhausting. We also have a fur-baby. My Molly is a boxer mastiff mix who we rescued. I’m a very blessed woman. Thanks for the interview Kelly, I’m so glad and honored you joined out little team! 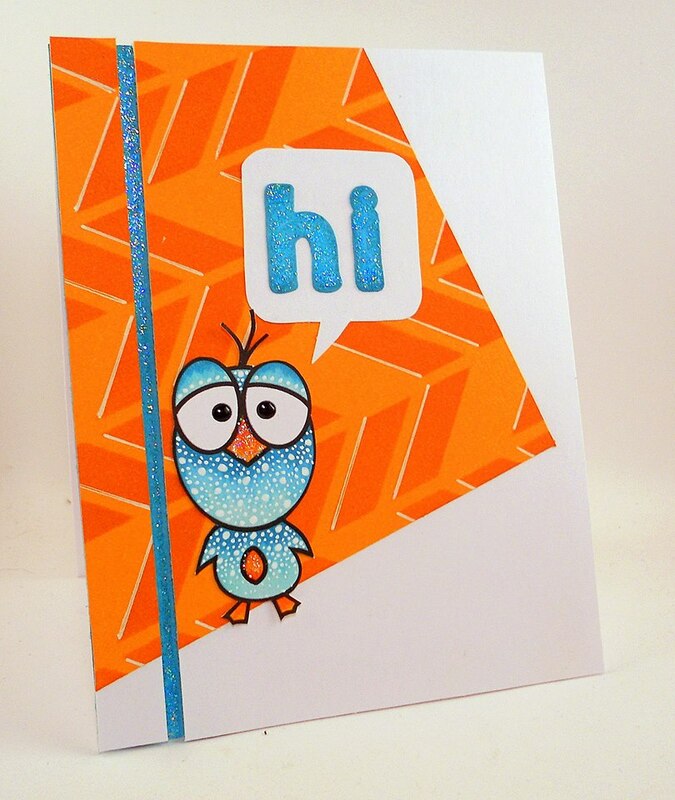 Kelly made a cuuuute glittery card with our bird freebie to say "hi". Honestly - this is perfect, isn't it? I LOVE the white spots that she made with a gel pen. Now hop over to Kelly's Blog and leave her some love. She has adorable, clean creations! Good morning an happy sunday! I hope you're having a crafty weekend. I did a lot of crafting yesterday, but have to pause today because I'll be getting some new braids and have to sit for about 7 hours. Okay, enough smalltalk, let's see why we're here - it's time to reveal the next Design Team Member. 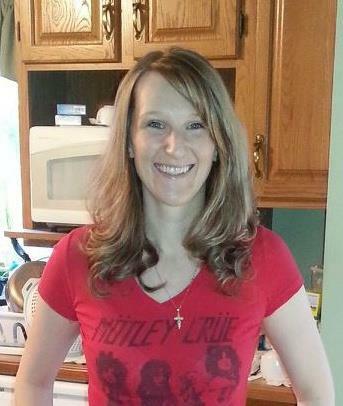 I know she is VERY excited to be an "official" DT member now, hehe. Tanja used to play along with our kis-challenges - that's how we found each other. When I started my cards-related facebook page Tanja was the first who said welcome and we got in contact. From that day on we were in contact nearly every day and we became some kind of online-friends. :) She's lovely, creative and she has her very own style - I have never seen something close to that before. Tanja, 42, somewhere between Hanover and Hamburg, Germany. Hi Tanja, glad you join us! Take a seat, get comfy. May I offer you something? Coffee or cookies? Definitely cards. They have a good size. I sometimes make something else, for example a bookmark or a box (if it's necessary for a challenge). I'm not fixed. I think my cards are versatile. Today this, tomorrow that. But I like paper piecing and coloring with copics very much. I can't really describe it. When I see a project, it's an impulse. I think "oh my gosh it's amazing" or not. It doesn't depend on the technique or style. Find your own way and style. Pick some inspiration but don't try to copy it. It’s important to be true to yourself. There's no need to go mainstream. Good lesson! Let’s get to something personal. You live in Nienhagen. What’s your favorite spot there and why do you think people should visit this place? I’m sure other people think my village Nienhagen is boring. Maybe they are right. But I love it. It’s green everywhere, most people known each other. When I go to the bakery for example and I forgot my money it's not a proplem. I pay the next day. You know what I mean? Kitschy - right? Most in the world I love my two kids. When I would like to make a card and it doesn’t work my day is done and I’m angry!!! Almost all of my cards get a (black) border. Without this border they are not completed (in my opinion). I’m glad to be a part of the crafty community. It means a lot to me and is so much fun every day. Thanks for the interview Tanja, I’m so glad and honored you joined out little team! Christine – I thank YOU, that I could be a part of this amazing team. I’m sooo proud! If you want to see more of her creations, ho over to her blog and become a follower! Friday already - that was quick! We still have anough to share until the first stamps are released. Today is day 3 of our Design Team Reveal - yay! Time to get to know the next of our lovely girls. Samantha left the most encouraging comments on my blog for a long time before I joined the Newton's Nook Design Team, where we finally met. (She's still leaving comments, but I am happy I finally got to know her better and work with her!). She's lovely, talented and very very supportive. I feel so honored she joined us! so happy to see you! Take a seat, get comfy. May I offer you something? Coffee or cookies? Hi Christine!! I’m so excited to be here! I’m not a coffee person (*gasp*), but I do enjoy cookies! I think like most people – paper crafting has always been in my blood! I used to save my coins in elementary school for school supplies, and as I got older, my school supplies got cooler, and eventually turned into paper crafting supplies! I always say, school supplies are the gateway drug to paper crafting! I made my first scrapbook in 2001 (ack – I shudder looking at it now!! ), and I really got down and dirty in this crazy, crafty world in 2008-ish. I love ALL projects! Ha! I’ve embraced cards for a few years. I just LOVE being able to make a sentiment, image or background POP in a small canvas! And to brighten someone’s day when they receive it...icing on the cake! I also love making scrapbook pages! I just love being able to document my little menn and their life, and the funny things they do! When I make scrapbook pages, that’s for me. A little crafty reward to myself, so I can cherish that moment in time always. Hmm. I love trying new techniques all the time! I’m loving watercoloring (who isn’t?! ), embossing paste and anything with vellum lately, though! More often than not, I like to make people smile, so I’ve been known to make a silly sentiment now and then! As far as frowning when I look at other people’s projects...I don’t! People put their heart and souls into their projects, just like I do. It takes a risk to put yourself out there, and I respect that, and always try to find something in a project to smile about! Let’s get to something personal. You live in … what’s your favorite spot there and why do you think people should visit this place? I currently live in South Carolina, near Charleston. I’m relativly new here. We have lived all over the US. My favorite spot has to be the beach!! LOVE the beach! I grew up in Florida, and the beach was a HUGE part of my childhood, so I like to pass that on to my little menn. Charleston is also (quite literally!) dripping with history here. So if you like American history, this is a place to be! Well, hmm. I would say, considerate and funny! I always try to be there for other people, and it’s important to me, to think of others. And I really like to make people laugh! Well, I don’t do Twitter. I used to avoid it because I thought I wasn’t cool/important/smart enough to do it. Now I avoid it because...well, it’s been this long! Also, hashtags intrigue me, and I try to use them on my instagram photos either ironically, or for added humor. Thanks for the interview Sam, I’m so glad and honored you joined our little team! 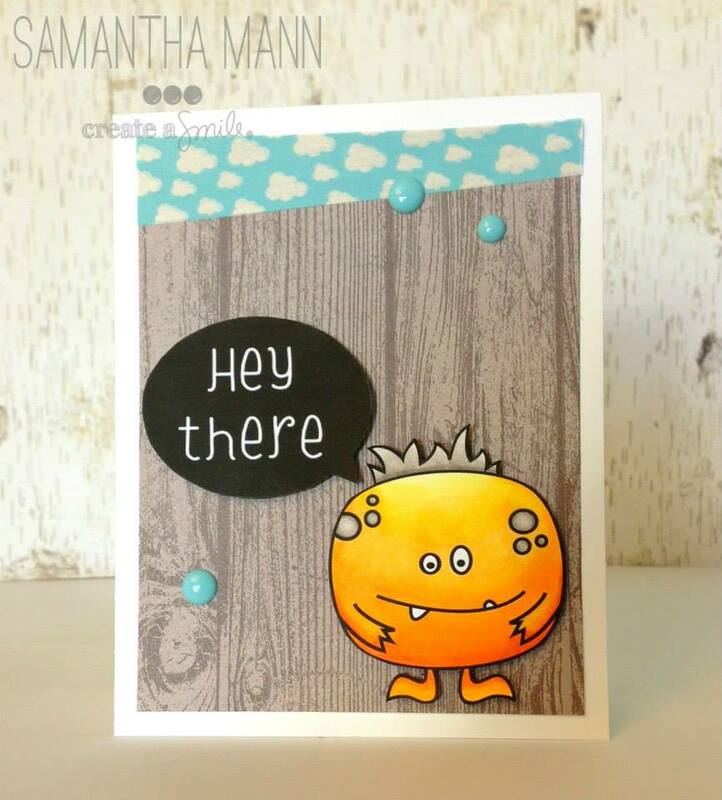 Sam made a card using our monster freebie . her coloring is amazing - I LOOOVE this! Wow, what an exciting week. Our Facebook-page is full of awesome cards created by YOU. I wish I could tell just how much I am exciting about seeing that you like my images and use them! I feel so honored! 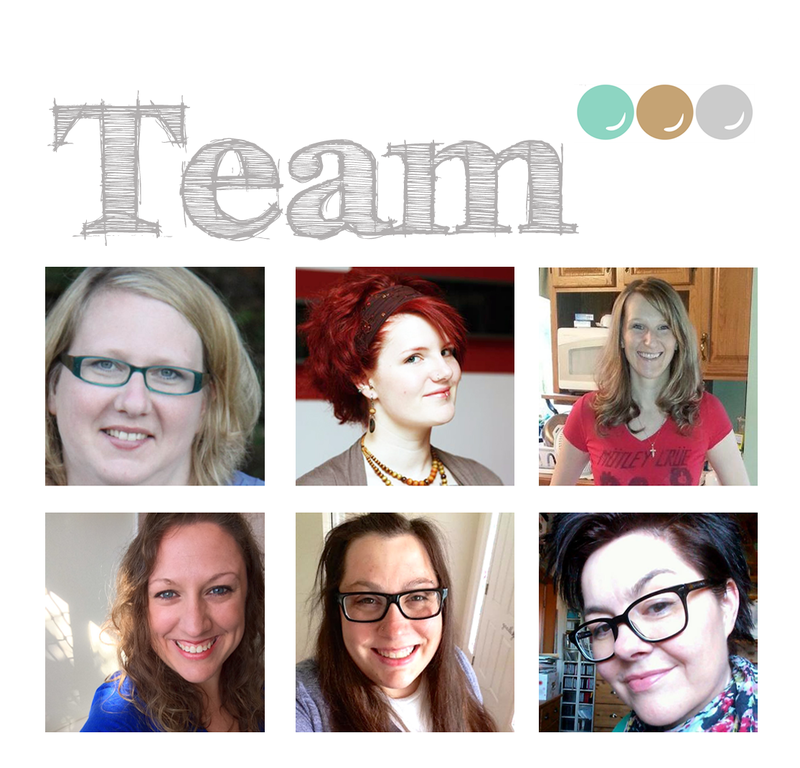 Today is day 2 of our Design Team Reveal - woohooo! As I already said: We have the most talented girls on our team. And they're just as excited as I am - yay! We all can't wait to get the stamps and inspire you. I guess this was not a surprise ;) Anni and I have been taking a crafty journey together for quite a while now. We started playing our "Lottie and Lisa" back in 2011, started the Keep it Simple-Challenge in 2012 and we kind of inspire each other all the time. Did you know Anni's card were the reason why I started cardmaking? I saw her work and thought "Oh my, I want to do this as well!". 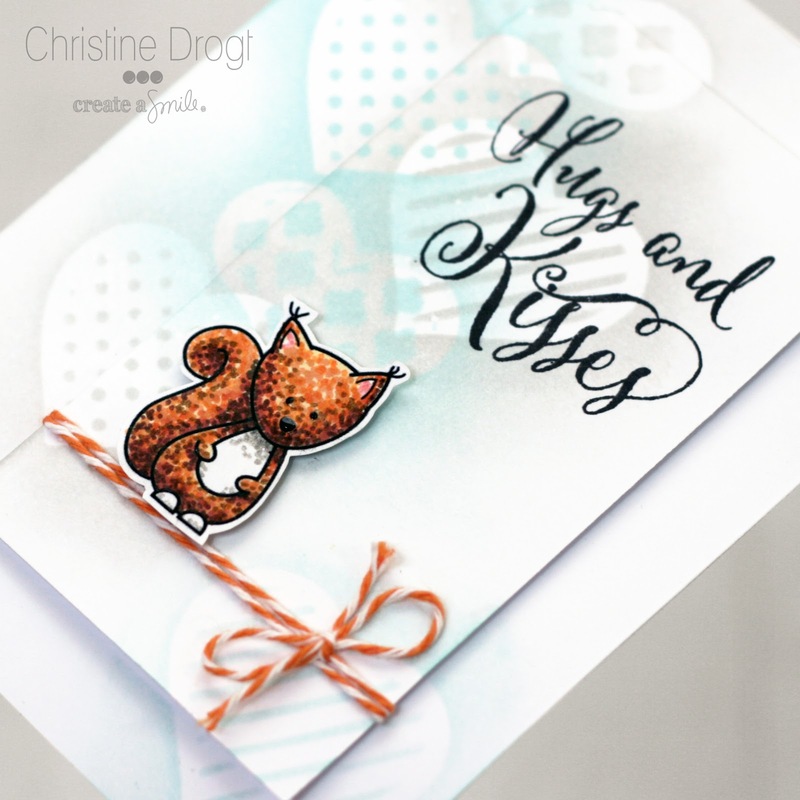 She has always been my cardmaking-idol, because her cards ROCK!!! I am sure you all want to get to know her. glad you're here! Take a seat, get comfy. May I offer you something? Coffee or cookies? Coffee please! With milk and sugar! It happened in the year 2008. Back then my hobby was Fimo. I visited a stamp shop because they were selling Premo (something similar to Fimo but from another company, hard to get in Germany). So I was in this shop with a lots and lots of stamps! I was totally flashed! 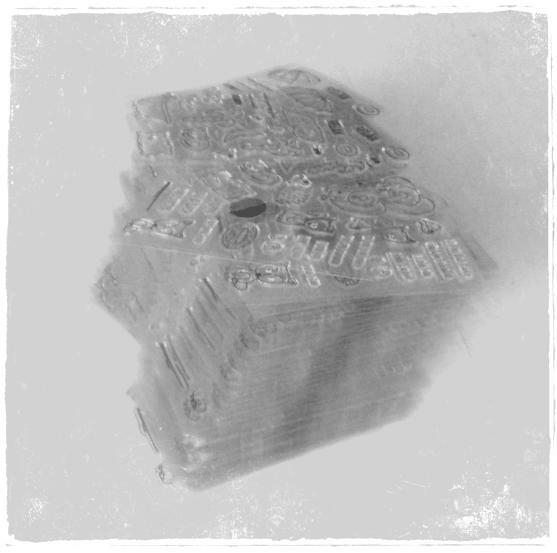 At that day I bought my first stamp and never looked back at Fimo. Most of the time I make cards. They are easy to send away and make people happy (and make them smile ☺ ). I’ve never tried scrapbooking, not really sure why! Sometimes I make a box or a bookmark but that’s not very often. At the moment I am totally addicted to watercolors but I think that's true for a lot of people! I love paper piecing (In my opinion it is very relaxing) and emboss resist! I love one layer cards and always find them hard to make! So if I see a beautiful olc it always takes my breath away. As an addict to CAS cards I really don’t like cards with a lot on it! Don’t be so hard on yourself! Most of the time I am my toughest critic and I have to remind me that it is a hobby and it is supposed to be fun! Just let it flow and try different things – it doesn’t have to be perfect! Well said! Let’s get to something personal. You live in Berlin what’s your favorite spot there and why do you think people should visit this place? My favorite spot in Berlin? Seriously? One spot? I could tell you about thousands of beautiful spots in Berlin. I LOVE Berlin! It is a fantastic city and I am so happy to live here! Ok, one spot you HAVE to visit when you are in Berlin: The Tempelhofer Feld. It is a former airport and now it is a park, a very, very big one (300 hectare)! There are so many different people, lots of culture, sports, animals…It is so big you can always find a place alone! But you can also watch people windsurfing on skateboards, urban gardening, fly a kite and so on and on! I am laughing a lot! And I like people that make me laugh! And I like to make people laugh! 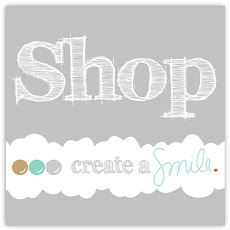 I am very proud to be a design team member for Create a Smile! My crafting place is always very tidy but my working place is chaotic! Thanks for the interview Anni, I’m so glad and honored you joined out little team! 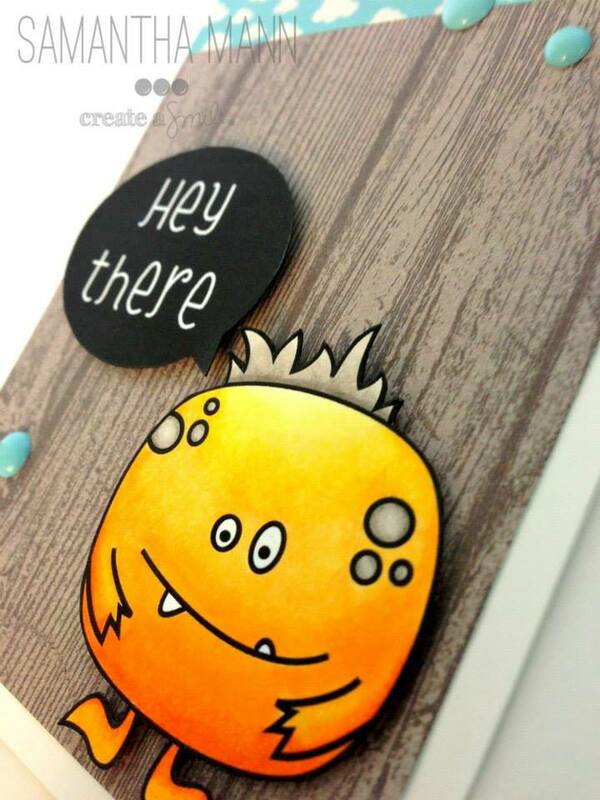 Anni made a card using our monster freebie. Don't you agree that she's amazingly talented and this card just ROCKS?! This girl wowes me all of the time. That bow! aaaw! 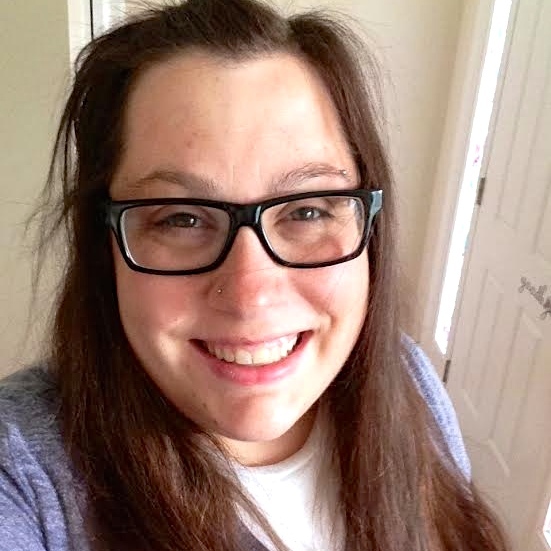 Anni has TONS of inspiration on her blog, so check it out and become her follower. Tuesdays are my video-post days on my blog. I did create a Create A Smile digi-card so I thought I'd share the video here as well. But first of all: I made a sentiment for the monster that you can use as well. Now, here's the card and the video - enjoy! And don't forget to check back tomorrow, we'll announce the next member of our fabulous Design Team! Hope you had a nice weekend. Our was exciting, revealing our Facebook-Page and also out Blog and Twitter Account. People seem to be exciting about the upcoming stamps - so are we. We still have to wait (at least a few weeks) for the first release - but he have so much more to share with you while you join us, waiting. First of all, we'd like to introduce our Design Team members to you. It's a team of super-talented, kind, supportive, (even beautiful, although this was not the point in our decision, hehe!) girls that will rock our stamps. They're already doing hard work in the background: collecting stamp-ideas, playing with images, planning surprises for you,.. and a lot more. nice to meet you! Take a seat, get comfy. May I offer you something? Coffee or cookies? I’ve always loved paper, stickers, pens, ink etc. One day, in 2006 my sister mentioned a papercrafting store that was just up the road from our house, so we went to check it out. The rest, as they say, is history ☺. I first started scrapbooking in about 2008, and cardmaking around a year later, so I’m fairly new to the industry in some ways. I love different styles for different reasons! I love cards, because they’re small, easy to ‘fill‘ the space, I love that they are designed to be sent to someone. I also love scrapbooking layouts, because I love the freedom they offer (with their size), I love that I can make them to help remember things about our lives, and that some day, my children, (and maybe grandchildren) will look at them and feel connected to me. I love Mixed Media canvasses, because they allow so much fun, and almost nothing is a mistake, you can always add to it or alter it more to create the effect you were hoping for. It’s play, at its very best. I’m really not sure. I think my techniques change a lot because my style changes a lot. I dont have one particular style. I do love stamping, adding layers and distressing the edges, I love colour and I adore humour in my crafting. If you can, try not to craft with the purpose to be on a Design Team, or to be well known etc, just craft because you love it. Be real and honest, and the rest will often come. Let’s get to something personal. You live in Perth what’s your favorite spot there and why do you think people should visit this place? I live in Perth, Western Australia, but I have to admit, it’s not my favourite city, not at all. My family are here, and we’re here for them and my children. It’s a beautiful city, don’t get me wrong! My favourite place here in Perth would be near the wineries down south of the state, it’s near the ocean too, so it makes for some gorgeous areas. My favourite place in the world is Japan, I lived there for 2 years and it’s never left my consciousness. I miss it every moment of every day. To me, it’s home. I think I’d either be known as loyal or funny. I tend towards humour a lot, I love seeing people laugh at something I’ve said or done. And I’m loyal to a fault. I love having people rely on me, and asking me for help. It really makes my day. Ummmm, I have no idea. I can do accents? I’ve done them since I was a little kid, I’ve always loved singing and acting, so listening to people with an accent speak, I tend to end up copying them without really meaning to! Thanks for the interview Linda, I’m so glad and honored you joined out little team! 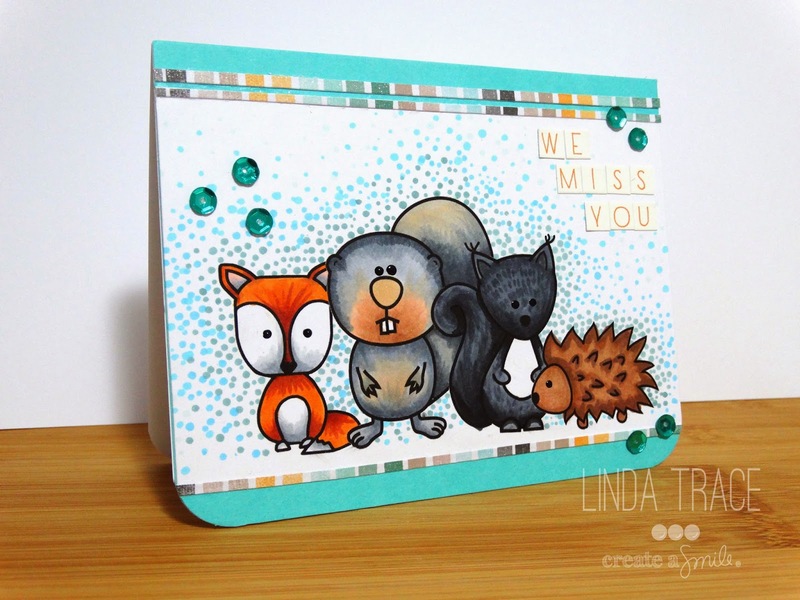 If you are new to Linda - Check out the blog and become a follower - she always comes up with amazing designs! 200 Facebook-likes! Time for another freebie!